The best Make Ahead Lasagna Recipe has a homemade meat sauce with beef AND sausage as well as THREE kinds of cheese. No need to boil the noodles ahead of time, either! Freezer-friendly. Scroll down for a video tutorial! I love making recipes that involve separate components. Lasagna is a great example. You make the homemade meat sauce first, then you mix up the 3-cheese filling while it simmers, and then you layer everything lovingly in a pan. However, as much as I enjoy making lasagna, I love eating it even more. Especially this version, my unofficial Best Make Ahead Lasagna Recipe. It’s tried and true, made again and again (by my family members, friends, and me), and it’s always a crowd-pleaser. This recipe is Make Ahead because instead of boiling the noddles, they soften in the sauce overnight. This is crucial if you despise watery meat sauce in your lasagna as I do. Another pet peeve of mine? No-boil lasagna noodles. Have you ever tried the no-boil lasagna noodles? They literally shred on your fork. I am not impressed. At some stores (ahem, Target) you will ONLY find no-boil noodles. Yet I’ve never met a person shopping in that aisle (and yes I’m that crazy person that interacts with the general public) who actually likes the weird shredding situation that accompanies no-boil noodles. So, we make THIS make ahead lasagna with regular noodles. Need a make ahead lasagna to freeze? You’re in luck! This is my go-to meal when my Mom friends have a baby because it can be eaten immediately or frozen, and also because it’s comforting and there will absolutely be leftovers. Just thaw overnight in the refrigerator. In fact, I recently made three at one time: Two for friends that recently had babies, and one for The Hills. Delicious! Save this The Best Make Ahead Lasagna Recipe to your “Main Dishes” Pinterest board! The best Make Ahead Lasagna Recipe has a homemade meat sauce with beef AND sausage as well as THREE kinds of cheese. No need to boil the noodles ahead of time, either! Freezer-friendly. In a large saucepan or Dutch oven, cook beef, sausage, and onion over medium heat until well browned, about 10 minutes. Drain the fat if desired. Stir in garlic until fragrant, about 30 seconds. Stir in crushed tomatoes, tomato sauce, tomato paste, water, sugar, basil, Italian seasoning, fennel, salt to taste (I like 1 tablespoon but you can use less) and ¼ teaspoon pepper. Simmer uncovered for 30 minutes, stirring occasionally. 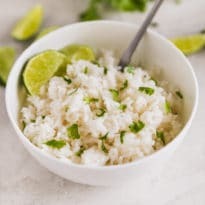 Meanwhile, in a large bowl, combine ricotta cheese with egg, parsley, and ½ teaspoon salt. Chill until the meat sauce is finished. To assemble, spread 1 cup meat sauce in the bottom of a 9-inch x 13-inch baking dish. Arrange a single layer of uncooked noodles lengthwise over the meat sauce. Spread with 1/3 of the ricotta mixture. Top with 1/3 (about 5 ounces) of mozzarella. Sprinkle with 1/3 cup Parmesan cheese. Spoon 1 cup meat sauce over the cheese. Make another layer of noodles, ricotta mixture, and mozzarella and Parmesan. Repeat layers 1 more time, for a total of 3 layers. (You will have about 1 quart sauce left which can passed separately or reserved for another use). Spray a large piece of foil with nonstick spray and cover baking dish. Refrigerate at least 8 hours or overnight. To bake, preheat oven to 375° F. Bake for 25 minutes covered with foil. Remove foil and bake an additional 25 minutes or until hot and bubbly. Cool 5 minutes before serving. If you have a tall 9-inch x 13-inch baking dish, such as this one (which I have and love), you will have enough space for 4 layers of noodles. The total amount of sauce, ricotta mixture, and cheese is the same, but you can divide everything by 4 instead of 3 to make the extra layer. Thank you so much for leaving a comment. :) The day I made yours, I also made one for myself. I’m glad your family enjoyed it as much as mine did! I always use uncooked regular noodles. Just use tad more sauce and increase baking time. Haven’t cooked noodles in Years. Will try your make ahead idea when pressed for time day of dinner though! I never thought of letting it sit over night! What a great technique! You can’t beat a really good lasagna. Love your tips – thank you, Meggan! I’m a big fan of mixing beef with sausage too – pack in that flavour! Megan! This looks so awesome! I love a good lasagna and sadly have also had bad luck with those gross no boil ones. And yes I ALSO talk to people in the aisles so we are both weirdos. I bet this freezes wonderfully too huh! Question! I’ve never made a make-ahead lasagne – do you cook it fully first and then freeze it? or do you assemble it, freeze it and then bake it? Hi Erin! The way this one works is, you only cook the sauce but everything else is cold. Noodles are uncooked. You assemble it, and then you could either refrigerate it overnight and bake it the next day, or stick it in the freezer, thaw it overnight, and bake it the next day. I hope that helps! If you have more questions just let me know. Thank you so much! Hooray, Erin! I hope you like it. :) Have a great week! Meggan, when you say “thaw overnight,” do you mean in the fridge or out of the fridge? Made this tonight and need it for Wed night so I just put it in the freezer… Thanks! Can’t wait to try it! Hi Erica! Thank you for the question and sorry that wasn’t clear. You should thaw in the fridge (you should always thaw things in the fridge for food safety, no matter what it is, rather than just at room temperature). In your case, I’d pull it out of the freezer on Tuesday night and put it in the fridge so it will have 24 hours before you bake it Wednesday night. You should be in good shape! Just make sure you bake it to 165 degrees. You’ll be all set. Thank you Erica! Holy YUM! And I just gotta give a heck yes to these normal-and-still-don’t-have-to-boil noodles. 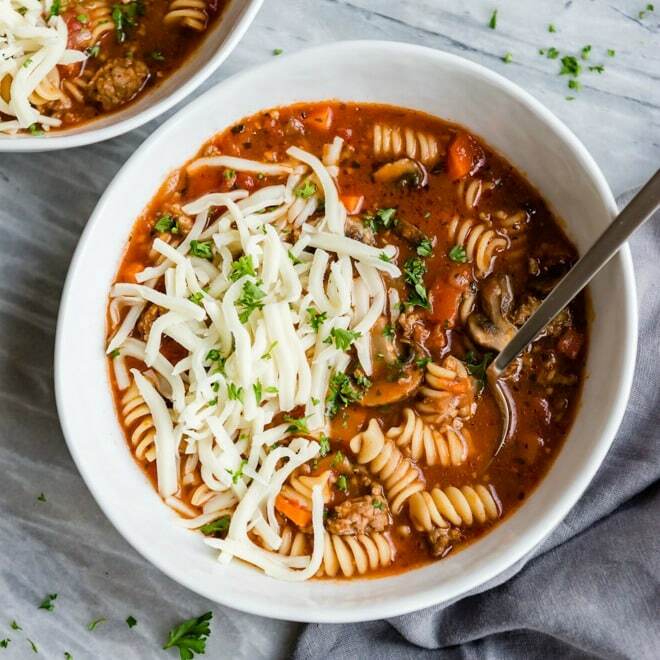 This recipe is just everything! I just made the meat sauce today and our house smells delicious. I’m planning on making the lasagna Sunday afternoon to have for dinner on Monday night. Do you think it’s fine for the lasagna to site already-made in the fridge for 24 hours? I wasn’t sure if the overnight/8-hr suggestion was the ideal timeframe? Part of me figures by overnight you meant for dinner the next night but perhaps you meant earlier in the day (not that there’s anything wrong with that!). Sorry if that’s a stupid question…. Hi Amanda! Not a stupid question at all. 24 hours in the fridge is fine! I’ve done that myself. The 8 hours is basically the minimum I recommend to make sure your noodles soften, the “overnight” is more of a convenience thing. 24 hours is just fine. The noodles have max amount of liquid they will absorb. Honestly I think even 48 hours is fine. Thanks for checking! I hope you love it. This recipe looks delicious! I have to feed a large family party 30+ adults. There are a few vegetarians in the mix so was hoping to make this dish along with another that doesn’t have meat. Do you think your technique to not cook the lasagna noodles would work in other recipes too? Or do you have recipes that are vegetarian but similar to this one? Thanks! Hi Natasha! The technique with the noodles will work provided you have a sauce with enough liquid in it, so YES! The meat has nothing to do with it. But, if you used a white sauce instead of a red one, I’m not sure what effect that would have. But let’s say you were going to use spinach and mushrooms, or squash and peppers, or anything else like that in the sauce instead of meat. Yes. You’ll have no issues. I don’t have any such recipes posted, but I think you could probably find a good vegetarian recipe you like online and just try to match it up to mine to make sure it makes sense. I hope that helps! From a fully refrigerated state it only needs to cook for a total of 50 minutes? Is that long enough for cooking since there’s an egg in the recipe? Hi Beth, it just needs to get to 165 degrees. You cover it for the first 25 minutes so I think that helps it get it hot, fast. And then remove the foil to promote browning. But yes, if your oven is running at the right temperature (375 degrees if you set it at that temp) it will be hot and bubbly by then. I’ve never had an issue. Just make sure it hits 165 degrees! Hi Eva, the sauce has extra liquid and it softens the noodles. I swear it works as long as you make the sauce as instructed. It’s crazy, but it works! I am trying to size it down to an 8 x 8 pan. How long would you recommend for the cook time? Hi Flo, I am not sure off the top of my head. Do you have a thermometer? You want it to get to 165 degrees in the middle. I’d probably still bake it for at least 20 minutes with the foil on, then test it after 15 minutes with the foil off. And just go from there. Good luck! Do you bake the lasagna directly from the fridge or let it sit at room temperature for a while before baking? Hey Cheryl, I baked it right from the fridge! I don’t necessarily like to let things sit at room temperature for food safety purposes. But it’s a great question! Thanks. I have made this before and it was awesome… This time however I forgot to layer the mozzarella cheese so i put it on top, it is in the oven now…I am so hoping I didn’t mess it up!! No worries Carol! You didn’t/can’t mess it up. Cheese on top sounds perfect! Probably even better. :) Thanks for your comment! Is there a reason you don’t mix the mozz and parm into the ricotta mixture? It would simplify things a little. There is no reason at all – it literally never occurred to me. I have always made lasagna in layers like that, but you’re right. Just mix them in! Seems obvious when you say it. :) Thanks Laura! Thank you so much for this recipe! My brother in law said it was the best lasagne he has eaten to date. I was a bit skeptical about not cooking the lasagne sheets before layering the lasasgne but they turned out perfectly cooked. Also the meat sauce was just perfect. Thank you so much Debbie! It means a lot that you took a chance on my recipe which, I know, sounds weird (not cooking the noodles). I’m so happy to turned out and that your brother-in-law liked it too! Amazing! Thanks for letting me know, and take care. I made this a couple days ago and it turned out great! The noodles cooked perfectly. I did question the amount of salt that the cooking directions listed…it said ONE TABLESPOON, which I think is a lot of salt, especially since it had Italian Sausage in it. I chose to put 1/4 teaspoon of salt in the sauce and 1/4 teaspoon in the ricotta mixture and it came out perfectly. Thank you for your comment, Sue! Your point on the salt is a good one. I can definitely alter the ingredients to advise a range for salt. For me, a tablespoon of salt tastes corret, but you loved it with just 1/4 teaspoon. That’s amazing! So, I should list a range and maybe say in parentheses “(I use 1 tablespoon salt)” or something like that. That way, no one ends up with overly salty food. Honestly, salt should always just be listed as “to taste” in many instances, such as with making sauce, but people reading recipes like clear directions. So, good for you for doing what you like! I’m really glad the lasagna turned out for you. I will make sure the recipe suggests salt to taste with my suggestion there. I am glad you know yourself and you’re willing to use less, some people are so scared to modify a recipe. Thanks and I hope you like it! Curious how you would adjust the cooktime after freezing this? Hi Rheya, if I froze it I would thaw it in the fridge overnight the day before I wanted to make it. That would essentially put you back to square 1 and you wouldn’t need to adjust the baking time since it was thawed. If I were baking it straight from the freezer I’d add 30 minutes to the baking time and just check it with a thermometer at the end to make sure it hit 165 degrees. I hope this helps! Thank you for your question! Hi. This receipe sounds amazing. I am making it with just 2 lbs 85% ground meat no sausage. Question: Do I drain the meat? Seems lloke a lot of grease. Thanks. Hi Judy, that is a personal choice. My recipe doesn’t say to, but you could. I will add that in to the instructions (or notes) so people recognize their option. I once heard that “true Italians” would NEVER drain the grease, that’s where all the flavor is, but that is just one opinion. And yes, it definitely depends on the type of ground beef you use too. Thanks for the question! If you try it, I hope you like it. Thanks and take care. Hi there….do you end the layers with lasagna and sauce and some grated cheese… or just the cheese mixture. This is too interesting not to try. Hi Lorraine! Sorry for not getting back to you sooner! I usually end on a layer of cheese mixture, possibly with extra cheese on top. But honestly you can do whatever you want, and you’ll have plenty of sauce to end on sauce. You should do exactly what you want! And to your other comment, I know it seems weird putting in dry noodles. But you’ll see – you’ll see the magic! I hope you love it. It’s my favorite. Good luck and please let me know how it goes, if you want to! Ok….I left the question just above about the top layer. So what I did was, since my dish is deep, I added a fourth layer without ricotta….just sauce, mozzarella and parm. I’m a marinara girl but I think the lasagna pasta needs the richer meat sauce. I can’t wait to see how it comes out. Looks great! Can I sub cottage cheese for the ricotta? Do I still use the egg if so? Hi Emily, sure and yes! You can substitute cottage cheese if you want to, that’s fine. I would still add the egg. Thanks Emily and good luck! Ok….I posted twice above with questions. I was sweating this one out. I kept checking he pasta all night to see if it was softening…..and sure enough…IT WAS! You said to have faith, that it was going to work. But I still wasn’t confident. Well, it turned out great….they guys all went back for seconds and it was a hit. The noodles weren’t under cooked or over cooked.. I goofed a little and added more sauce to each layer because I didn’t think the one cup would be enough. But judging by how saucy I made it, I think it would have been fine. And I didn’t have to do a thing Sunday morning, other than worry about it….lol. 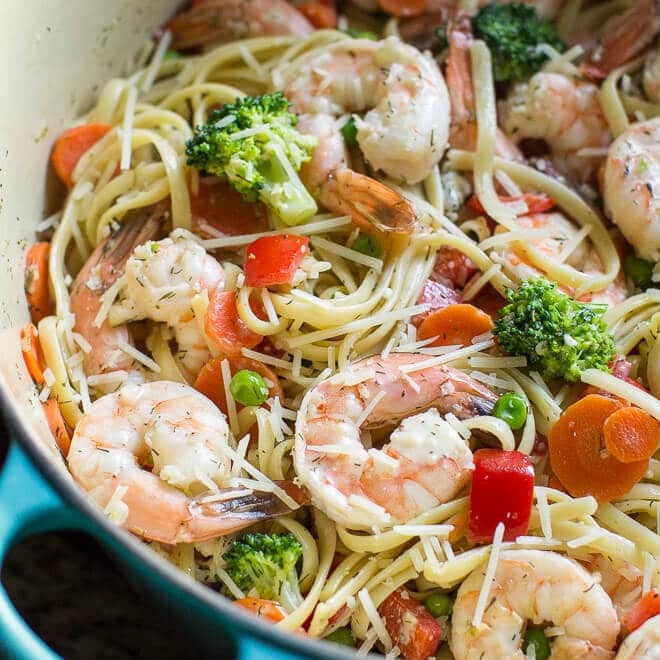 So now I’m gong to try the one pot pasta dishes with shrimp….looks great and so easy. Hi Lorraine, I am so relieved for you!!! I feel bad for all the undue stress I caused you, but thanks for sticking it out until the end and I’m glad it worked out and EVERYONE ATE IT. LOL. That’s the most important thing. Thank you so much for reporting back. If you need anything else just let me know! So you use regular lasagna noodles, not the no boil? Hi Vicki, yes. You use regular noodles, they go in to the dish uncooked, and then they soften overnight. Please let me know if you have any more questions! Thanks! Hi! My question is can you make this and cook it and then freeze it? Hi Lynn! Yes, you definitely can. Personally I would leave it unbaked and freeze it like that, and just thaw it overnight and bake it the next day. But you can absolutely bake it, freeze it, thaw it, and reheat it. Please let me know if you need any other information. Thanks Lynn! SIgh. I could only find no boil noodles today. Wil it really be horrible? Ha ha ha! Your sigh made me laugh. You know, a lot of people in the world LOVE no-boil noodles, that’s why they exist. So don’t let my opinions dissuade you. I think it will be JUST fine, delicious even. No worries! Thanks Van. Can you make this recipe with whole wheat lasagna noodles? Hi Erin, I’m sure you could although I haven’t tried it. But I imagine they would work the same way. You cook them the same way as you cook regular lasagna noodles, right? So I would think they would soften the same. Thanks! The recipe was good, but I used ALL of the sauce and wished I had even more to use. It was kind of dry the next day after cooking. Also, ricotta is now being sold in 15 oz containers, so I had to buy 2 in order to have the 16 oz that the recipe called for. If I make it again, I will also increase the amount of ricotta mixture that I use, so I would not end up with a partial container of ricotta cheese that will probably not get used up. I will also not use shredded mozarella cheese, if I make it again. I think that the slices of cheese make for a much more gooier, tastier lasagna. 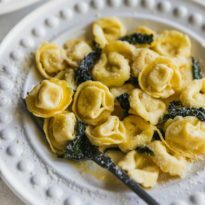 Question: can I use a store bought sauce? If so, how much? Hi April! I’m sure you can… I just haven’t tested the recipe so I don’t know exactly how much sauce you would need. I will put it on the list to test so I can report back! Sorry I don’t have an instant answer for you. I will probably buy 2 jars myself and just make it and see what happens, so if you feel brave and/or experimental, you could definitely try it out. I just don’t know for sure if that is enough sauce. Thanks! Hi, I used two jars of sauce with a little more water. I had so much sauce that I made two 9×13 lasagnas: one for company and one for me two days later. It worked perfectly! Best lasagne I’ve ever made. My boyfriend, dad and brother loved it! Several times during dinner they remarked how good it was. Followed the recipe to a t. Making it again for company next week. Thanks for such a delicious recipe Meggan! Can I use a homemade pasta lasagna instead of the no boil one? Meaning lasagna made from scratch? I am just saw your sauce recipe and I can’t wait to try it along with your make ahead lasagna. It sounds delish. It’s. Christmas day and I am wishing I had this cooking instead of turkey..
Can’t wait to try and Merry Christmas to All. Hi Sandy, you are so kind! Thank you so much! I hope you love the recipes if you get a chance to try them… and I hope you had a very Merry Christmas! (I’m sure your turkey was delicious). Take care and thank you so much! I made a pot of sauce yesterday and it is in the fridge cold. Can I assemble this as in your recipe with the sauce being cold? and let it set overnight and bake overnight? OR do you assemble this with the sauce being hot? Hi Linda! Good question, assemble it with the sauce cold. The sauce does not need to be hot. It just needs to be… saucy. :) Thank you so much for the question, I’ll add this info to the post! I made your recipe for Christmas dinner this year and it was wonderful! The only thing I left out were the fennel seeds, only because I forgot to buy them. I’m not sure how much that changed the taste of the recipe but my family loved it! Being able to prepare it and then cook the next day was a godsend. My son will be 28 this week and he requested I make this for his birthday dinner. Thank you for sharing a wonderful recipe! I forgot to add the half cup of water! Its now sitting overnight in the fridge. Will it still work out? Hi Brittany, yes probably. The lasagna itself is quite saucy, so your version might be slightly less saucy. I would just poke the noodles around the top and make sure they softened. If, for example, the top layer of noodles still seem crunchy, maybe remove JUST those noodles and keep everything else. I think that’s better than tossing the whole thing. So just take a look! If it looks like good lasagna before you bake it, you’ll wind up with great lasagna in the end! Good luck! turned out great!! definitely going in the rotation. thanks for the the quick response. family lived it and I live the homemade sauce. I know this is somewhat of a repeat question but… do you think freezing it for two nights will do any harm? Followed by thawing out overnight and then heating as directed? Similar to what you mentioned in the intro, I’m making this for a new mom, but with a hectic schedule, need to make it two days in advance! Either way, I was excited to read about recipes for new moms, I’ve been on the hunt! If you are going to freeze to prepare later, do you freeze immediately after prep or do you refrigerate overnight and then freeze? Hi Keisha, either one. But if I had to pick, I’d let it sit for 8 hours and then freeze (you could let it sit for 3-4 days in your fridge before freezing, even). If you freeze it immediately upon finishing it, the noodles will soften during the thawing phase. But since it has to thaw AND soften, it might take more than 8 hours. I haven’t tested it specifically, but I feel like 12 hours would be sufficient to thaw and soften. I hope this helps! Let me know if you need anything else. Thanks. I have a quick question.. when assembling the lasagna do I only put the noodles lengthwise across the pan? What about the open spaces at the end of the pan? Do I need to break noodles to fill that space? Hi Kimberly! Sorry for the delay on replying. I usually do 3 full noodles across, and then I break a 4th to fit the end. I hope this helps. Thanks! What kind of mozzarella do you recommend using – fresh or regular? Can I bake it straight out if the freezer or do i have to let it thaw for 24 hours? I could let it soak the night before I freeze it. I want this to be a quick meal for a busy summer night. Hi Jennifer, I have never baked it straight from the freezer. I did some searches online, and they mostly say you should thaw the lasagna overnight before you bake it. However, I will test it myself and see if it works. They say that store-bought frozen lasagnas are meant to be baked from frozen, but homemade lasagnas are not. But I don’t know. I can’t think of a reason why you couldn’t bake it from frozen (but I would definitely soak it before freezing it). If you’d like to give it a shot without knowing what will happen, you could try baking it from the freezer in a 375-degree oven for 90 minutes (but check it at 60 minutes?). And I would cover it for sure. But I don’t know. But I will test it! Thanks for the question. I was looking at your 2 recipes-the one for your sauce alone and the one for the sauce with the lasagna. One says two cans tomato paste and the other says one can . And water is listed in only one . I am confused. Hi Valerie, so sorry for your confusion. The one for the lasagna has more water because it’s an “overnight” lasagna – you don’t cook the noodles, you put them in the lasagna dry. The extra water softens the lasagna noodles overnight and the extra tomato paste makes sure the sauce isn’t too watery. The straight-up meat sauce doesn’t need either of those because you just put it on noodles or whatever. So it’s nearly the same thing, but one needs to “soften” lasagna noodles and therefore needs a little more liquid. Does this make sense? Please let me know. I hope so. Thanks and sorry about that! I found your sauce recipe looking for a lasagna sauce for my dinner tonight. And since you conveniently linked your lasagna recipe I decided to go with that. But I kept to the original sauce recipe since I was boiling the noodles and cooking it tonight. The sauce turned out AMAZING (I doubled it for spaghetti later this week). Fingers crossed the lasagna turns out well. Since I didnt let it sit overnight. Cant wait! Thanks for the recipe! I don’t know why, but every SINGLE time I make a lasagna, I only have ricotta enough for two layers (never 3). I wonder why? Any thoughts about what I might be doing wrong? I would like to make this with just ground beef. Would it male a difference? Since there was no answer I made a prego with ground beef sauce and it turned out fine. Hi! My sauce seems very thick and was more like dollops when layering rather than a liquid sauce layer. Is this going to make it too dry when i cook it? I was thinking maybe id add just some jarred sauce over top? I took this to a family gathering yesterday and there was not a speck left!! Thanks so much for this recipe! I put it together last weekend and put it in the freezer. However, I did not leave it in the frig long enough to thaw. TIP for anyone who makes the same mistake I did — You will need to bake it 1 and a half hours. The sauce was super thick!! 2cans tomatoe paste and “ only” 1/2 cup water??? No sauce left over!! I have made this once and was delicious. Can this sit longer than 24 hours in the fridge? For example, make Sunday night and cook it Tuesday early afternoon? Did not like the texture of the 2 cans of tomatoe paste, I added wine to help thin it, but there must be a mistake?? One cup in the beginning did not cover the pan?? No left over sauce!! If I double the ricotta would I double the egg? This is really a wonderful recipe. Thank you so much for sharing. A few notes to keep in mind for people trying it out for the first time. If you are using the foil “lasagna” pans, they are slightly bigger, and you will have to make adjustments for that. I had to purchase quite a bit more of all the cheeses to make up for that. Plus, the timing for cooking will be increased as well. A thermometer for checking doneness is a must in my opinion. I did make one change and added a basil paste since it’s winter, and I really wanted the basil flavor to shine. I’d highly recommend making this once before bringing it to a family affair, so you can work out any changes you need to make it your own. All in all, an absolutely great recipe!! Even my Italian relatives were clamoring for more! Thank you so much for sharing this recipe! I have made this for Christmas dinner for the last three years and it is always a hit. Making it ahead of time takes the stress out of cooking and gives me more time with family on Christmas Day. Usually, I double the recipe so there are leftovers to share or to freeze and eat later. Another plus is very little cleanup! Better than any I have had at a restaurant! Hi Meggan, thanks for the recipe. I am planning a dinner party for 40 and plan on making your lasagna. I did a test run with the recipe last weekend and the family loved it. I was like many others and quite nervous that the noodles wouldn’t be done, but was pleasantly surprised and relieved when the knife went so easy into the pan for cutting into servings. Next week I will make 3 pans on Friday for cooking on Saturday. Thank you for sharing your overnight trick! I know this recipe was published long ago, bit since people are still commenting I thought I’d add my 2¢ regarding whether this can be cooked from frozen. It can. I don’t use the exact same sauce recipe (I’ve been making both lasagna & spaghetti sauce forever, so I don’t need to follow a recipe anymore). However, I’ve been making lasagna with regular lasagna noodles uncooked for years. As long as you let the lasagna sit in the fridge overnight after assembly before freezing it, it’s fine to just take it directly from the freezer into your preheated oven. As others have mentioned, the cook time is going to increase by at least 50%. One of the best investments I’ve ever made insofar as cooking equipment was the purchase of a Chef’s Alarm thermometer by ThermoWorks. Once the lasagna has thawed enough in the oven, I stick the probe right into the center of the lasagna, set the device to 165°, and forget it. It beeps when it’s done.